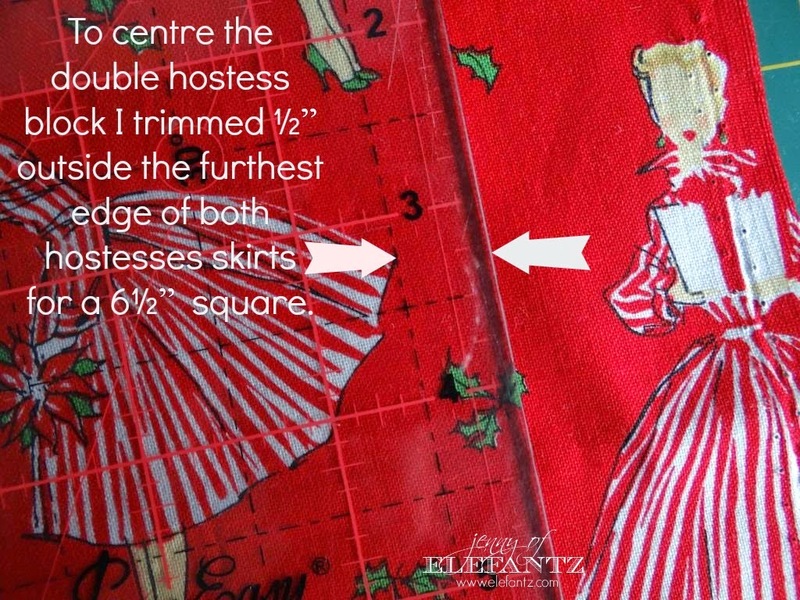 Jenny of ELEFANTZ: Day 3 - the "Holiday Hostess Table Topper" tutorial! 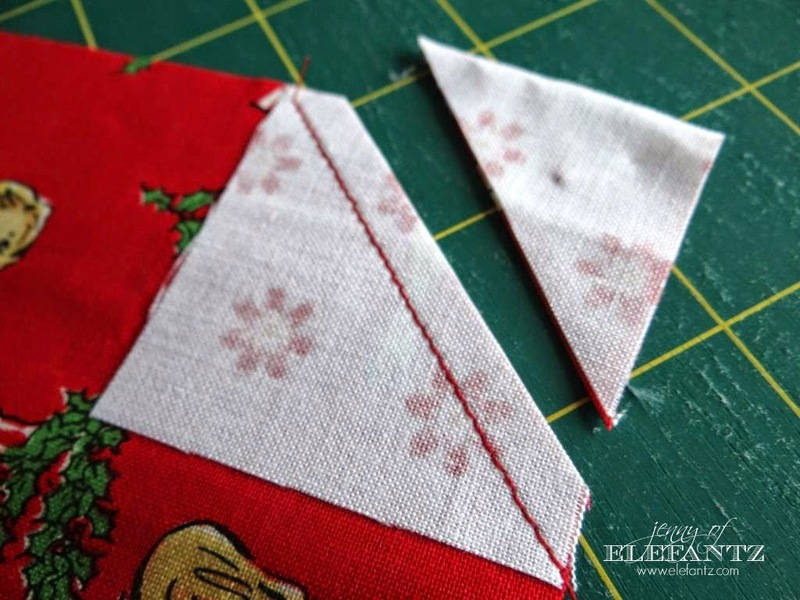 Day 3 - the "Holiday Hostess Table Topper" tutorial! How did you go with your stitching? 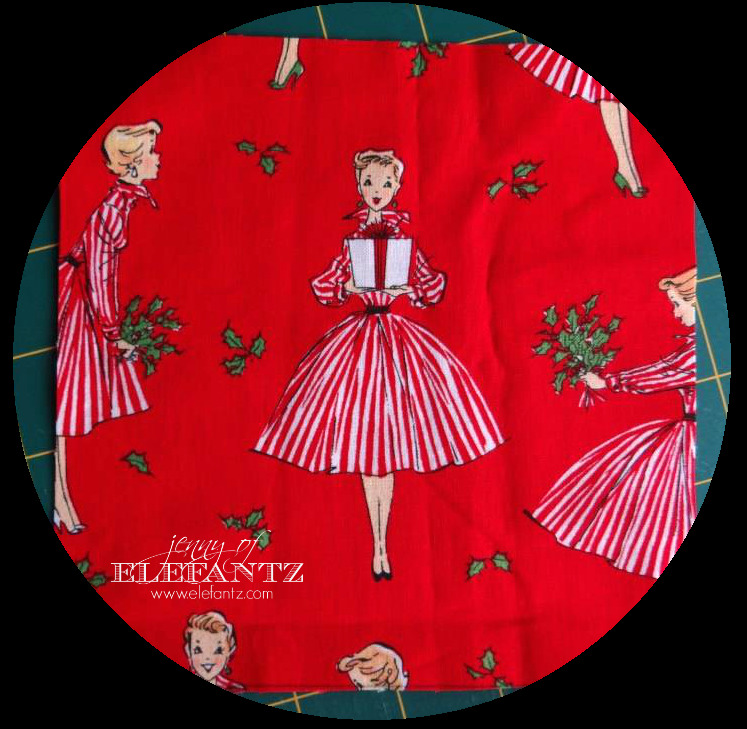 Did you finish the "Holiday Hostess" tree block? I hope you send me some photos if you have because I'm excited about seeing all the different fabrics and thread that will be used across the globe. You can email your photo to THIS email address and next week I'll have a show & tell on the blog to display your work! 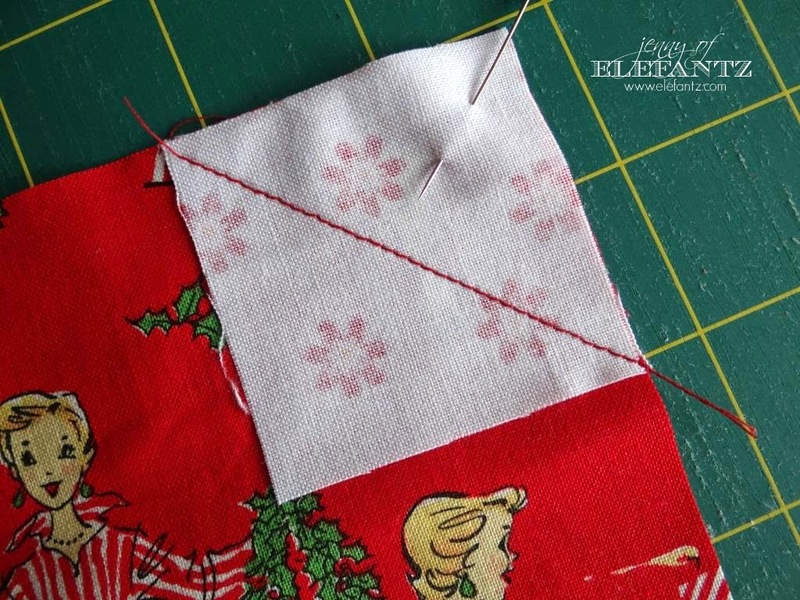 Today we're going to border our tree with some patchwork blocks. 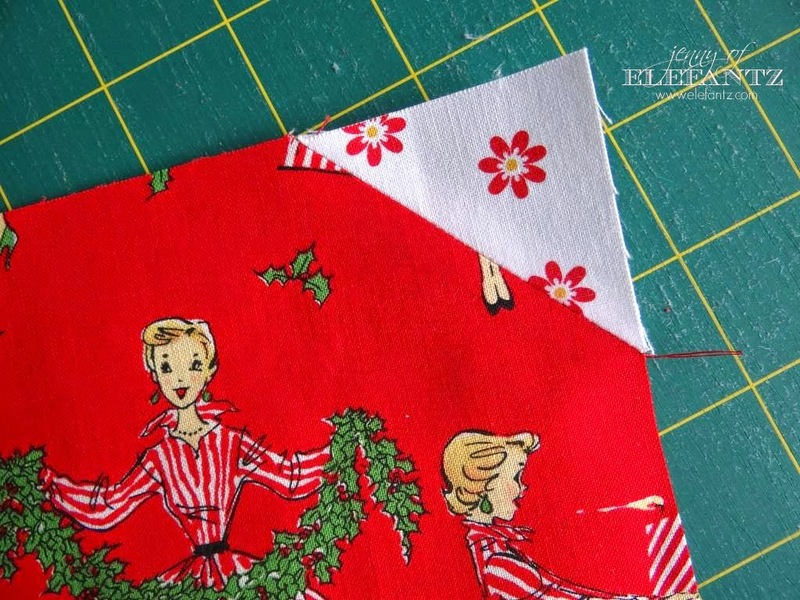 One of the reasons I chose the red hostess fabric used in my table topper was how perfect it was for fussy cutting. 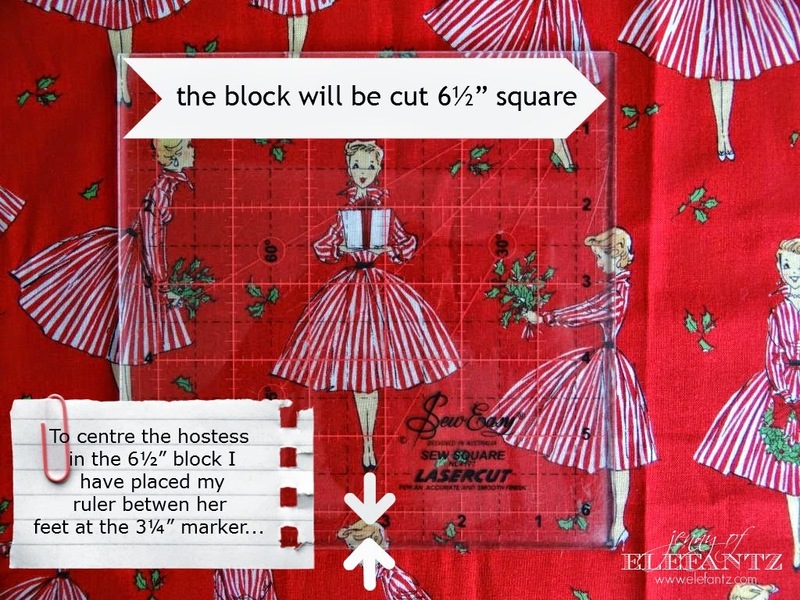 Then, when I considered what block would best display each fussy cut, and what block would be an easy one for a beginner in patchwork, it seemed fairly obvious. 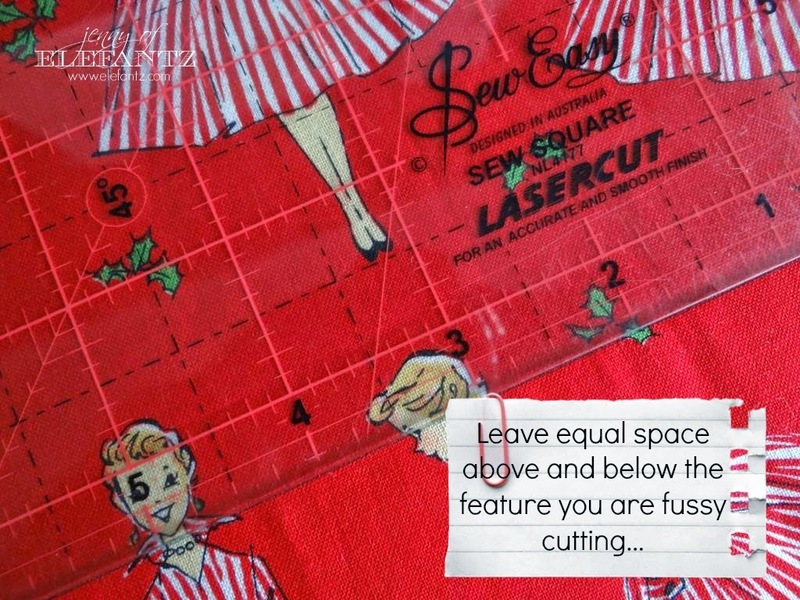 If you have chosen fabric suitable for fussy cutting this part of the tutorial will help you accurately centre the fussy section, and if you're using a fabric that does not require fussy cutting you can simply look over the steps below for future reference with another design. 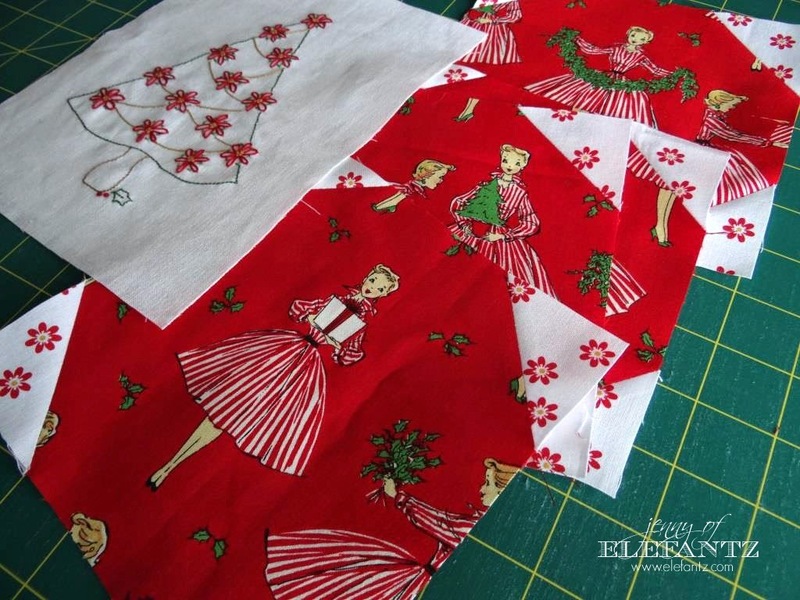 My fabric is actually called "Holiday Hostess" and was a line released by Michael Miller around 2008. It has a few different hostess scenes on the print so I chose four to work with in the design. 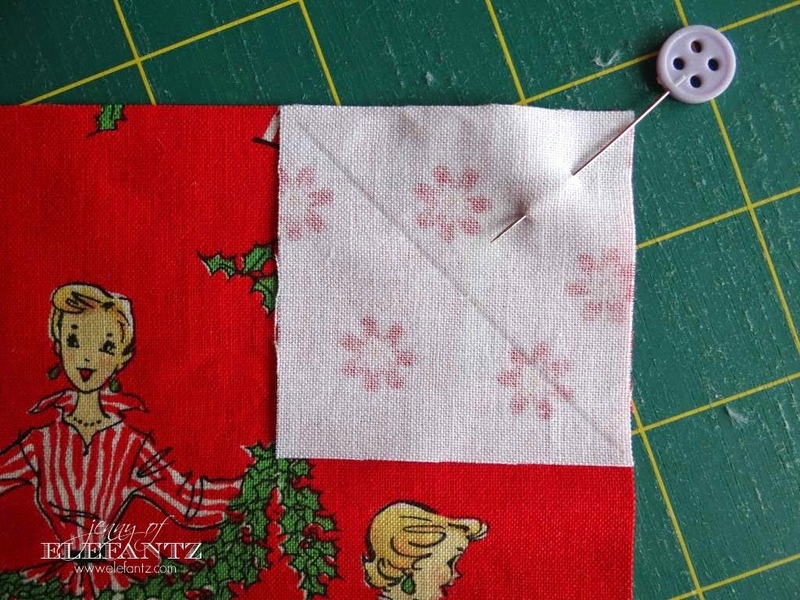 The four snowball blocks we are going to make each require a 6½” square of fabric, so positioning the 'fussy' area in the centre of the square is very important. 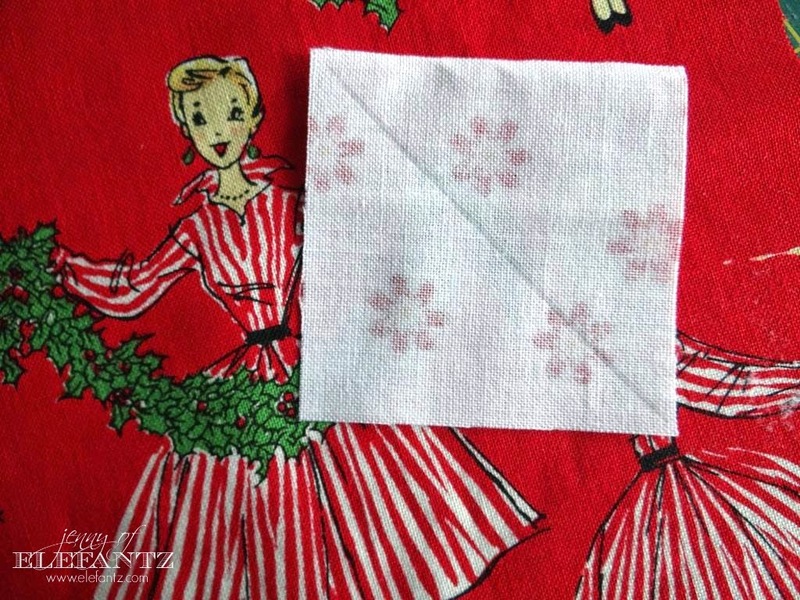 Choose one fussy area on your fabric that you'll be using in a snowball block and place a 6½” square ruler over it. When centering a feature look first for how wide the actual fussy area measures, and if there is an obvious middle. My second block was similar to the first and I centred it the same way. The third block featured two hostesses, so this required a slightly different fussy placement. 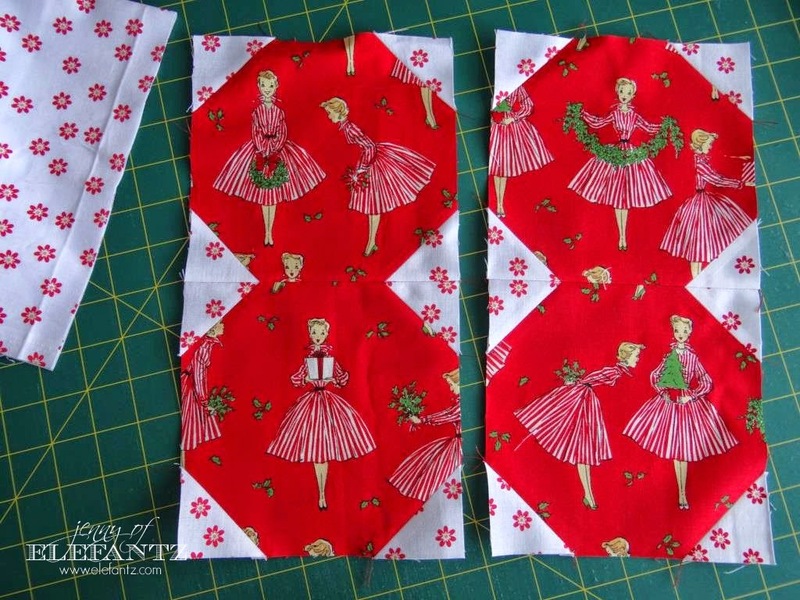 I used the skirts of the two hostesses to gauge the width of the block. From the left edge of one skirt to the right edge of the other was 5½", so this gave me ½” beyond the skirt edges at each side to make the 6½” width I needed for the block. Now all I needed was to adjust the height of the block to keep the two hostesses centred. As one was higher on the fabric than the other, I measured equal distance below the feet of the hostess on the right, and above the head of the hostess on the left. Once again I drew a line around the 6½” square ruler before cutting out the block. 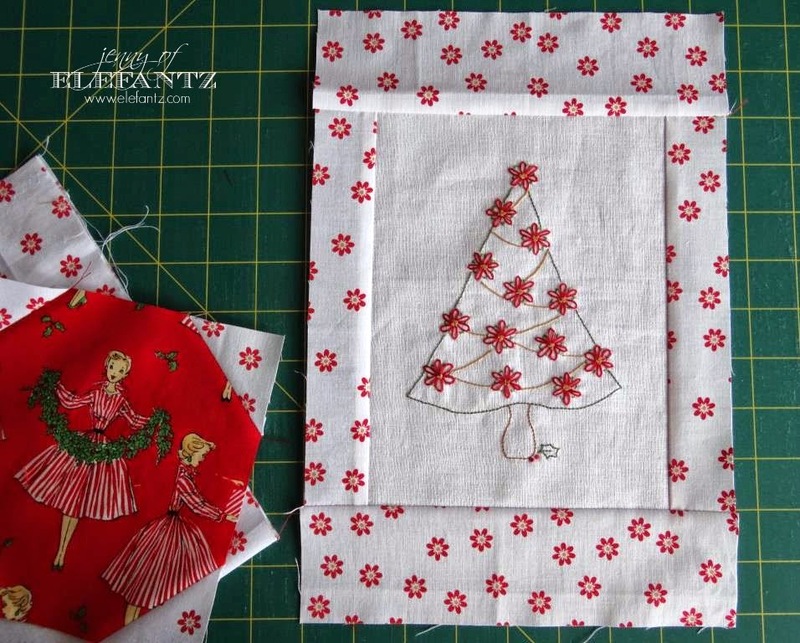 Sew the 1½” x 8½” lengths down both sides of the tree block. Press the seams open. 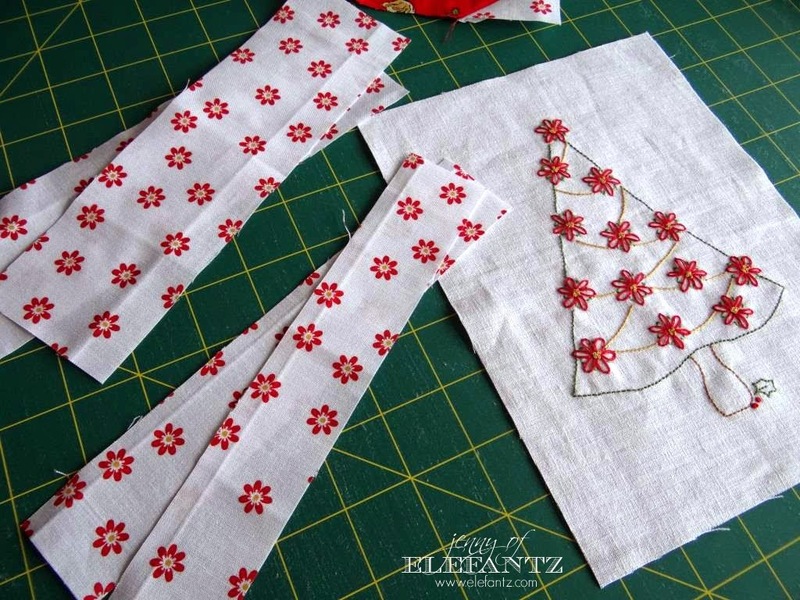 Sew the 2½” x 8½” lengths across the top and bottom of the block. Press the seams open. 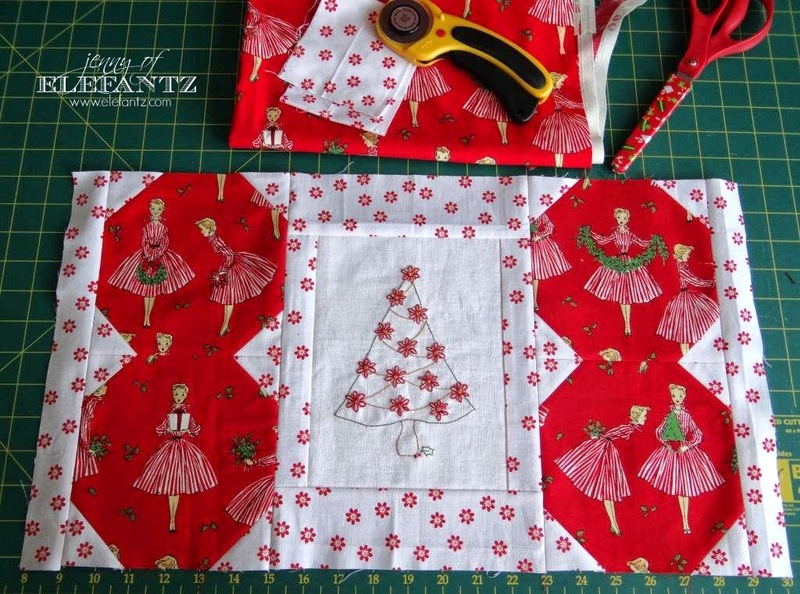 Sew one set of snowball blocks down the left side of the tree block, and the other set down the right side. 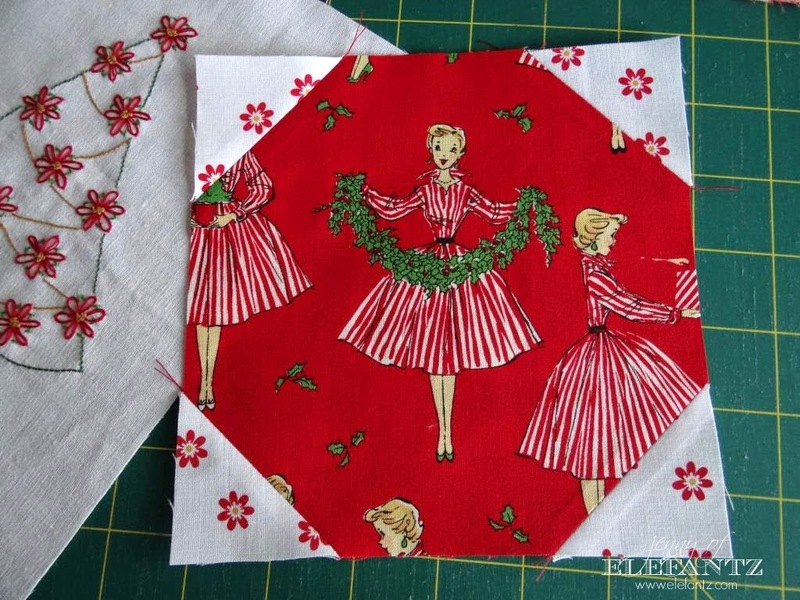 IDEA: This is the size I have chosen to keep the table topper, but if you're feeling adventurous, are already a seasoned quilter, or simply prefer a longer table topper, why not make more snow ball blocks and add them to each side? I have opted to turn this into a wall hanging, but it could easily have become a table topper too. 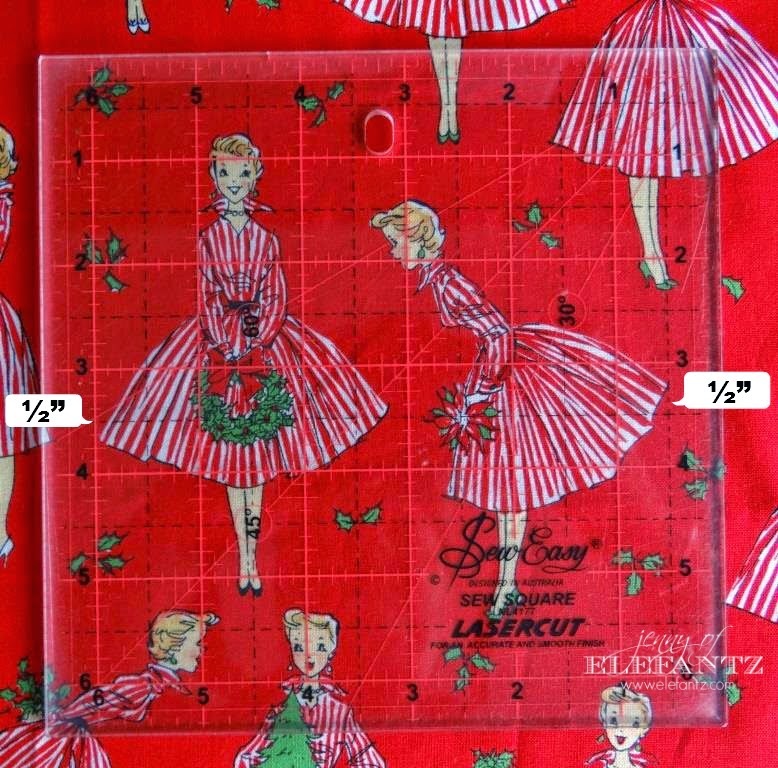 All I have done is cut 44, 2½” squares - 22 from one fabric, and 22 from another. 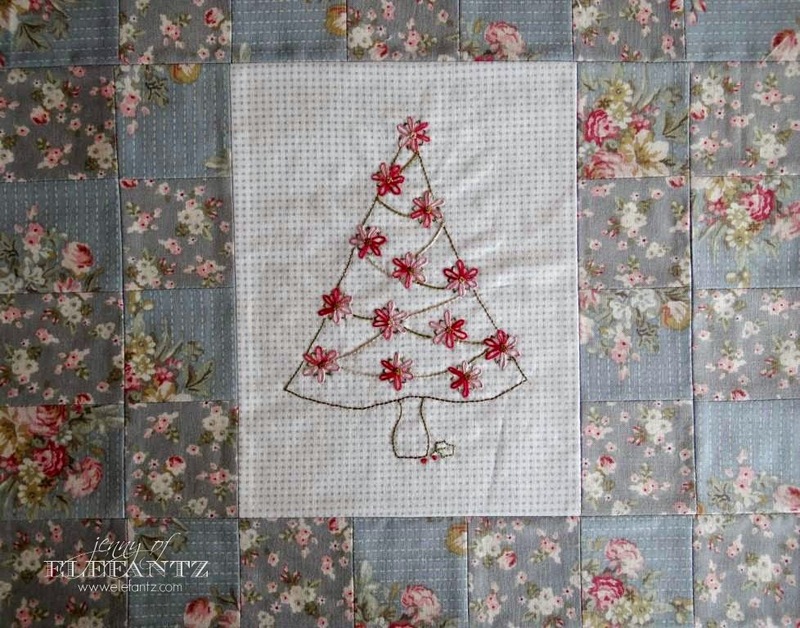 Tomorrow we're going to baste and quilt both the table topper and the wall hanging. 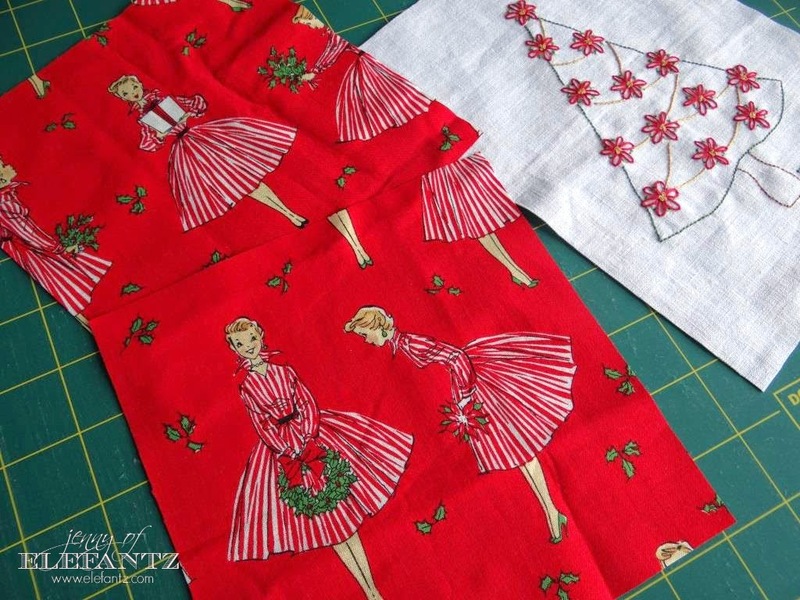 The table topper will be machine quilted, and the wall hanging will be hand quilted - you'll be able to see how easy both finishes are and how very different is their final appearance. 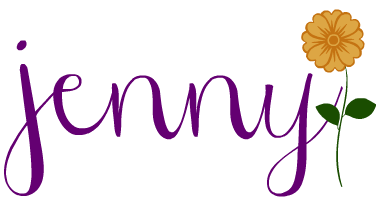 Loving your blog Jenny. Your stitching is beautiful - such tiny and even stitches. 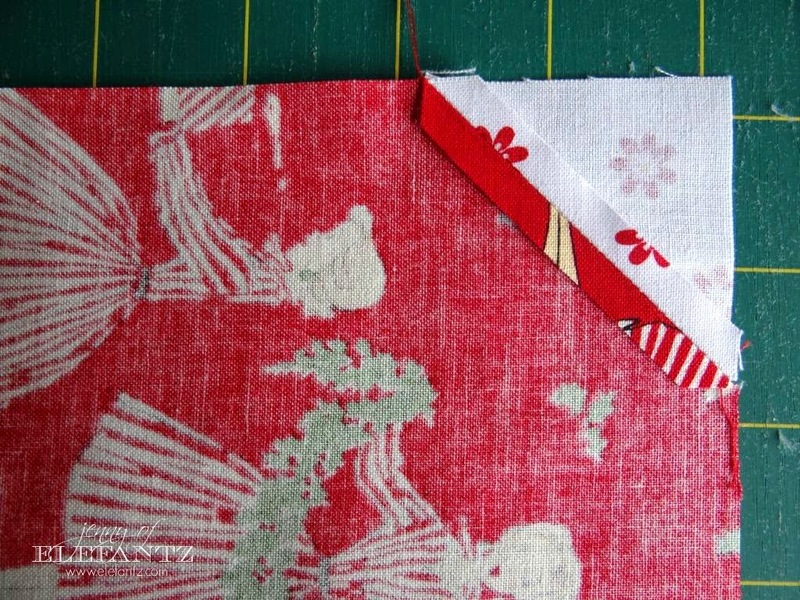 I am not a quilter (yet) but love to stitch a little. I love too, that you laugh so loud that the house shakes - I sneeze much like that!! Have a great day. Gosh, they are BOTH so beautiful! 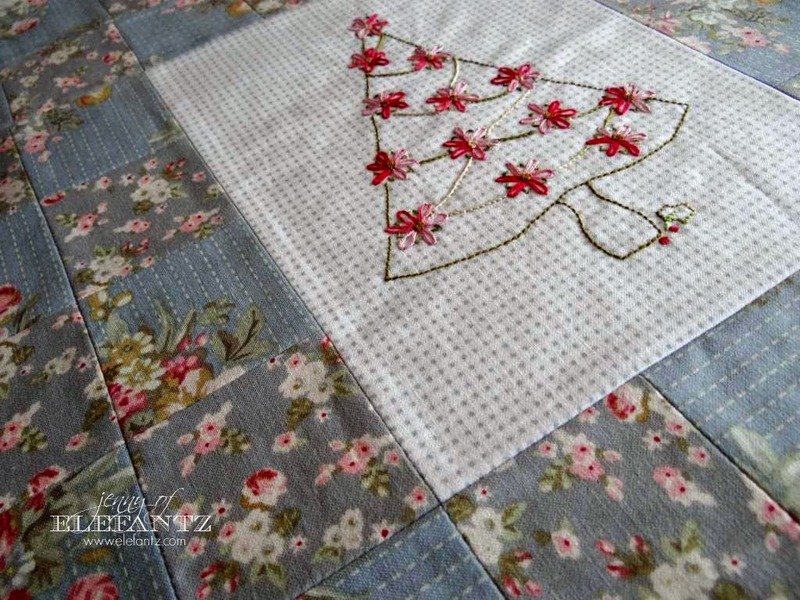 It is always great to see one stitchery done different ways. Loving those snowballs! Beautiful. I just finished tracing my design out and getting it hooped. They are both looking beautiful. So lovely to see the things you create. Thank you for this tutorial. Now isn't the snowball block the perfect choice for this - so darling, my dear, and so very clear! Charming! 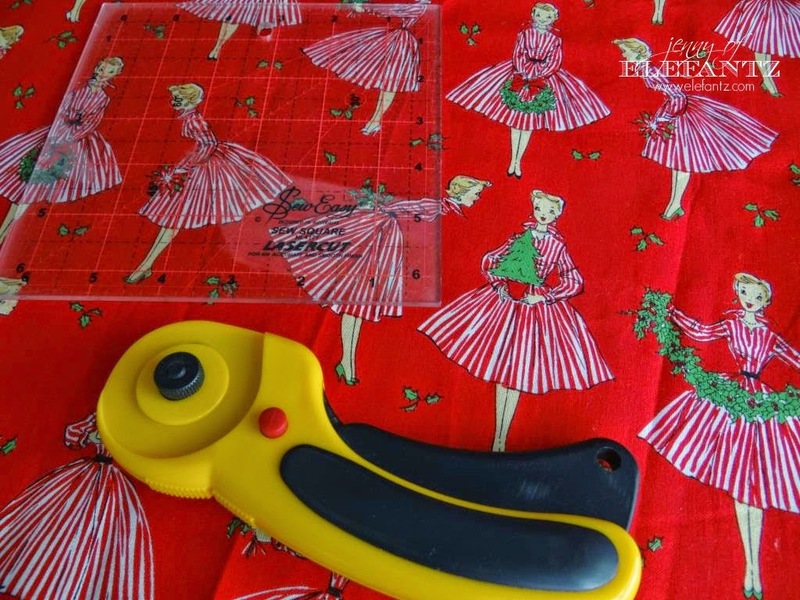 I love the retro fabric. Too cute. Love the stitches, so sweet. I look forward to the progress on this piece. Thank you for showing your designs. I am inspired by your spiritual message as well as your work. May God bless you and yours.